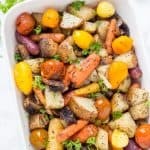 Easy Italian Roasted Vegetables are bursting with flavor from potatoes, carrots, tomatoes, and garlic. 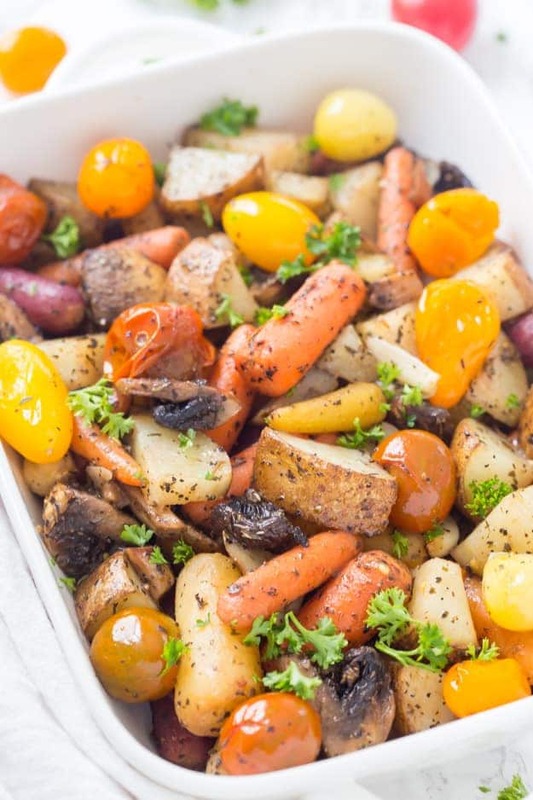 You will want to make these oven roasted vegetables with all of your meals! 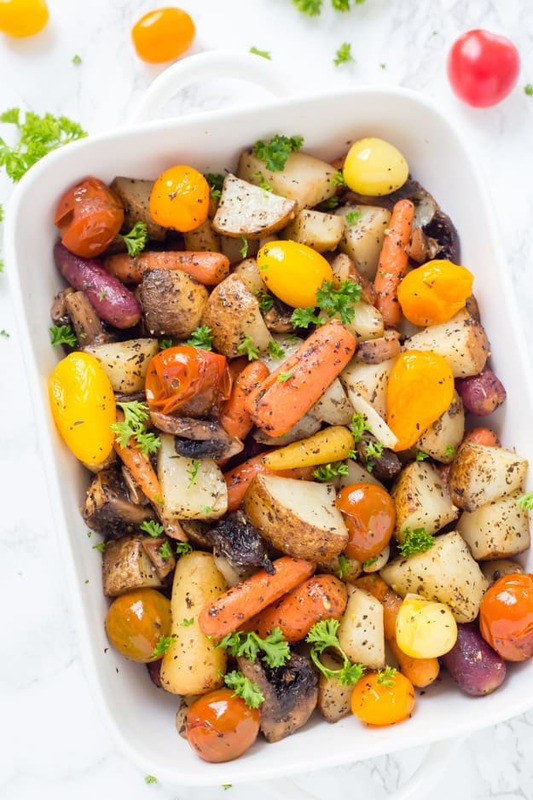 Roasted vegetables are one of my families favorite side dishes because they contain a lot of flavors, healthy, and they reheat well. Roasting vegetables are an excellent way to also clean out the fridge (we do this all of the time!). For this recipe, I decided to talk a peek into my fridge to see what needed to be used and it was mushrooms and potatoes. So at the store, I picked up some colorful grape tomatoes and gorgeous colorful carrots. Each was a little bit pricier, but I couldn’t pass them up! With almost all pasta dishes it’s great to have a side salad or vegetables. 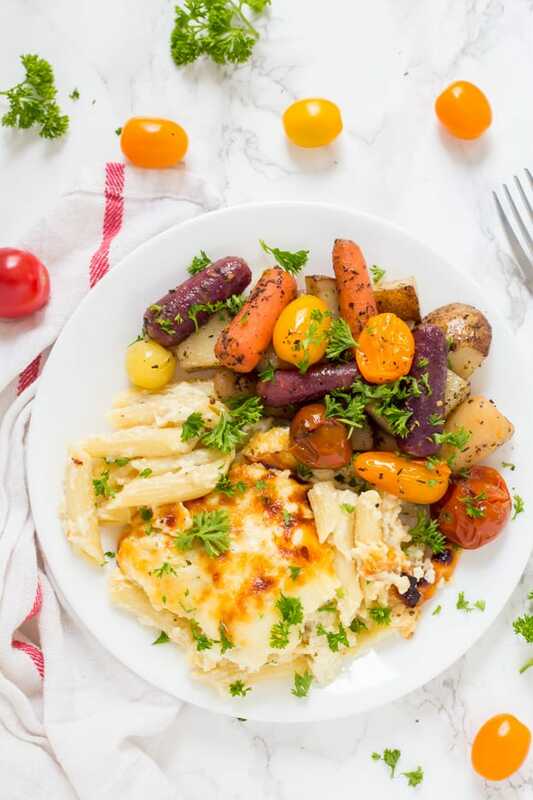 The Italian flavors in these oven roasted vegetables pairs perfectly with the three cheese baked ziti we had for dinner – so good! And the best part is you will most likely have all the ingredients in your spice cabinet already. Fewer trips to the store is always a good thing! Since we have a few different vegetables in this recipe and not all of them, need to be baked for the same about of time. I like to roast the potatoes and carrots first because they take a little bit longer to become tender. Once the potatoes and carrots are a bit tender, I then add the mushrooms and grape tomatoes. 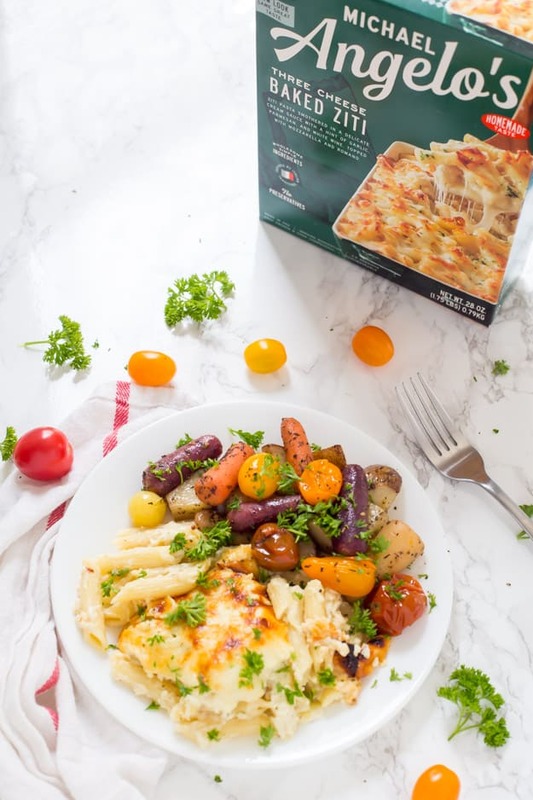 I decided to serve these delicious Italian roasted vegetables with Michael Angelos’s three cheese baked ziti. 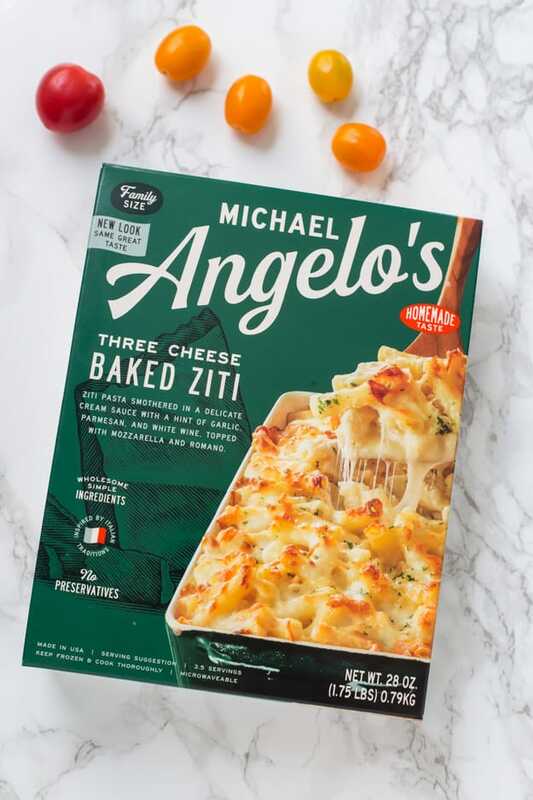 Our family loves how Michael Angelos’s dishes are only made with high-quality ingredients and flavor, the baked ziti was so yummy! You do not have to worry about preservatives, fillers, and artificial ingredients which are very important to me. We also love how Michael Angelo’s is a family company which the co-founders are mother, Sara A, and son Michael. Michael wanted to package her cooking for everyone to enjoy! On those busy weeknights, I love having something easy for dinner and this three cheese baked ziti was incredibly easy and so delicious! All you have to do is take it out of the package, place the container on a baking sheet and pop it into the oven and it’s ready to be served. You can find single serve entrees and family size entrees which are perfect for serving 3-4 people. We love the family size entrees because we have lunch for the next day. Do not overlap the vegetables: When roasting vegetables you will want to use a large baking sheet, so none of the vegetables overlap. If they overlap, you will steam them instead of roasting the vegetables. Flip the vegetables half-way through baking time: I like to bake the potatoes and carrots first for 25 minutes, and then I flip them half-way. It ensures all of the vegetables are roasted evenly. Add the quartered potatoes and baby carrots to the baking sheet, drizzle 1 tbsp of olive oil and season with salt and pepper. Bake for 25 minutes, flipping half-way through baking time. Add 2 tbsp of olive oil, garlic, mushrooms, grape or cherry tomatoes, dried basil, dried oregano, dried thyme to the potatoes and carrots and mix to combine. Season with salt and pepper. Bake for another 15-20 minutes or until the vegetables are tender. Serve and garnish with fresh parsley, optional. This looks so delicious and yummy!! Pinned to try later.